In emergency situations such as disaster or war hospitals will overflow with patients. And Giving patients intravenous (IV) solution is the first procedure of treatment. However, tall and heavy conventional pole hanger takes a lot of space and can easily fall over. This seriously restricts the movement of patients and medical workers in crowded hospitals. The goal of the design was to create a portable peristaltic pump for the patients who do not require precise dosage. Robustness and low production costs were also key design factors. Powered by rechargeable power batteries, its motor can easily control fluid flux through simple dial rotation attached to the side of the pump. 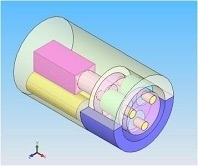 The tube can be easily attached to the side of the pump without any modification. The pump was also targeted to help patients with weak arms who would previously have had to carry around a cumbersome IV pole. This portable IV pump allows patients to attain better mobility by simply attaching to their IV tubes while walking. The “Best Student Paper Award,” at the 2nd AOTULE student workshop on mechanical engineering, KAIST, 2007. “Bronze Award,” at the 2nd annual creative design contest, POSTECH, 2007.